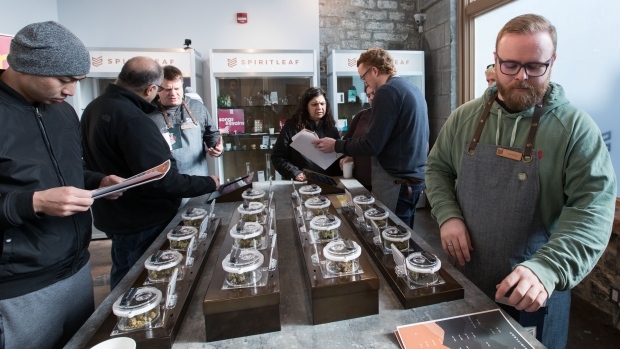 Seven out of the 10 Ontario pot stores that opened recorded an average of $50,913 in sales and 867 transactions on their first day of business, according to Cova, which provided an aggregate sales figure for the retail stores that use their software. That compares to an average of $4,976 sales per day per store and 111 average transactions over the first quarter of this year in the rest of Canada’s legal pot dispensaries that Cova tracks. Cova’s point-of-sale software is used by nearly 100 cannabis retail outlets in Canada to help manage inventory and sales, said Gary Cohen, the company’s chief executive officer. The average transaction in Ontario on the first day of business was $61.82, compared to $46.54 across Canada in the first quarter of the year, Cova said. Still, Cohen said he expects Ontario’s strong opening-day sales figures to peter out after the first two weeks of business, mirroring what the rest of Canada’s cannabis retailers experienced when they opened their doors when recreational pot was legalized on Oct. 17, 2018. “They had two weeks of above normal sales but after week three, those sales levelled off significantly to what they were going to be for the rest of the year,” Cohen said. Toronto’s The Hunny Pot Cannabis Co., the only legal cannabis store to open in Canada’s biggest city, saw strong customer demand in its first four days of operation. The store continued to draw a long lineup of patrons waiting to enter the store on Thursday, a similar scene to the first day it opened on Monday. According to a store manager who declined to be named, the store had about 800 transactions in the first three hours of business on April 1. Only 10 cannabis stores opened in Ontario on Monday, short of the 25 stores that the provincial government said would be operating that day. The delay of stores opening in the rest of the province has been blamed on regulatory and licensing issues. Several cannabis industry experts expect the first stores in Canada’s most populous province will help boost sagging sales, and put a bigger dent in the black market which has continued to thrive. Canadians spent about $307 million on legal cannabis in the fourth quarter, while spending on illegal pot products was $1.6 billion, according to Statistics Canada.